You guys know they have promotional coupons for a free month, right? Just paid for mine an hour ago! Can't wait! I'll be getting mine tomorrow after I get off work. I might have to marathon the original anime or the movies to get ready. So seeing as Australia is excluded from Crunchyroll distribution do I have any other legal options? Titles of Eps 6-9 were just released. Thx go to Reddit for raising the alarm on it. Ep 9's title aligns with a 2-part episode that closes out Volume 19. Which gives them presumably another 16 episodes to cover the remaining 2 volumes of Conviction, if that 24 total eps thing is to be believed. That's more than enough, given the pace they've set. So, we really still have no idea where this will end. Could be Hill of Swords. I just don't know. Can't be much further than Vol 22 given how the scope takes off dramatically during Millennium Falcon. Wouldn't make much sense, production wise, to group that within the same season. Nope, haha. It's no biggie though. It's only $6.95 a month and first 2 weeks are free. Anyways, it's more important for me to show my support to Berserk as much as I can. As most streaming companies go, they will be tracking what shows premium users watch first (ie what they signed up for). So I'm all for it. yeah its really cool what CR do, they said that the money they get from you goes towards the show you watch the most. if berserk is the only thing you're gonna be watching on there then most of that money will go towards it which is just awesome. I have to imagine that they're counting on views per show as the metric of success, and not counting which members are still on trials and which are paying viewers. That's how Netflix's business model operates -- the show makers get $ per view. I've never used CR before, and I imagine many here haven't either, so there's no harm in using a free trial. They still get their eyeballs, which they'll use to prove whether or not something was successful, and studios still get paid. 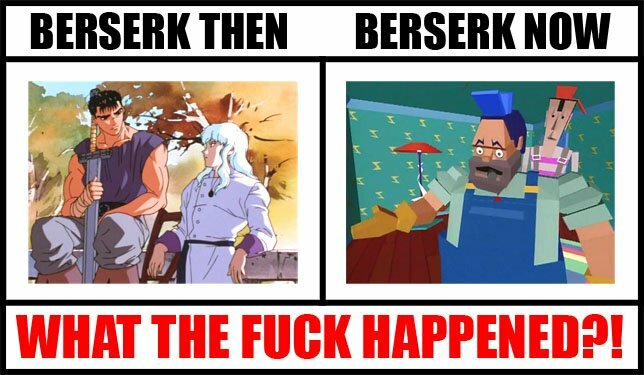 Am I the only one not seeing Berserk in the day schedule? I'm not good with this website so... help? I can offer no help, only confirm that this is also the case for me. I' guessing it will appear when it starts or something. What time zone are you in? I'm in the East so it should be on around 11h30 am for me. It should appear when the episode comes out - which will be in about 30 minutes. Here's to hoping that within these 24 episodes that we're given more character development then the films that this is a continuance of. I guess the only other question left to ask is this : If this performs "strongly" will we get another Tv-Series to cover The Millennium Falcon Arc? Its not available for Asia, New Zealand and Australia, so if you live there tough luck. Nah I'm in Canada so I should be able to watch it. It's just that I've never used CrunchyRoll before so I'm not familiar with how it works. How exactly is the new TV anime branded? I only saw ANN (not a good source) use the word Saga Project in combination to it and the show has VAs, the composer and 2 (?) tracks as carry over. The distribution partners changed though. And who the hell is Ultra Super Pictures? Someone will need to make the wikipedia page looks "right". It might as well be me, but i need sourced information first. FWIW, the title of Episode 3 is "Night of Miracles" which corresponds to a very popular episode in Vol 17. So I'm not sure what the "all new" thing necessarily means. If Episode 3 is written by him entirely, it should be good. Fingers crossed Lost children gets animated. As I thought, it seems they want to wrap up the Conviction arc in a half season. Hm. I also wonder what parts of the first episode Miura worked on exactly. Those that were straight from the manga? Or maybe touching up Isidro's lines or something. Anyway, quite curious to see the third episode now. I take it if he wrote it entirely that he felt he needed to, in order to preserve the story's integrity. I wonder what exactly they had cooked up before his involvement... Probably not something we'd want to see. Might mean that it was completely rewritten from the events in the manga? I'm not sure they can feature the business with the horse on screen for one thing. Fingers crossed Lost children gets animated. "Maybe, someday" = not by this team and not any time soon, as I understand it. As I thought, it seems they want to wrap up the Conviction arc in a half season. Yep, it aligns with the pacing they've set. But I wonder about the "maybe more..." line. Depends on how the first set was received, presumably. I take it if he wrote it entirely that he felt he needed to, in order to preserve the story's integrity. I also thought it was telling that he wrote "part" of Ep 1, meaning it could have been remedial in nature — something where he stepped in to rewrite it because he wasn't satisfied, and for Ep 3, he took the reins. We'll see. But I wonder about the "maybe more..." line. Depends on how the first set was received, presumably. Seems like it. Still, that's a dreadfully fast pace. Would they plan on adapting the whole series in just two seasons or something? I also thought it was telling that he wrote "part" of Ep 1, meaning it could have been something where he stepped in to rewrite it because he wasn't satisfied, and for Ep 3, he took the reins. We'll see. Yep, it's basically what I'd have expected to happen. Might also explain why he was busy for the first half of 2016. I would frankly prefer a decade long hibernation, instead of shoved in Lost Children (not that it will happen), and a new start from scratch. Episode 3 may even get adapted one of these days... and any side-quels /sequels will have to use the foundations the 2 projects gave us, so no thank you. Miura´s writing credit is interesting though, as i now know that he is fully "complicit". Not that blame anyone and putting 20 out minutes of animation is impossible in 2 weeks time, expect no "fixes", just more coherence. Our bed has been made ladies and gentlemen. The 12 ep. limit to my suffering is my big takeaway but why was Flora in the opening scene... What a way to and confuse the audience. Miura´s writing credit is interesting though, as i now know that he is fully "complicit". Was the guy who grabbed the Titanic's wheel and tried to steer the ship away from the iceberg complicit in its sinking? It's true, he's pretty awesome. Well Walter. This anime may look like nothing but this isn´t South Park. He can steer small parts of the very last batch in a better direction but ep. 3? Everyone sinks on our Titanic . These 2 should give some insight how anime get´s put together and the only way to drastically improve on a pilot is to do the US models, where they sit on it for half a year.